It was pouring buckets around time for me to run on my lunch break. I have been FIGHTING a cold, I will not say I am sick because so far it has not hit...but I have a sore/scratchy throat, sinus congestion and a persistent headache.. So I thought it best not to run in the rain and wait to get home. Had a great dinner, relaxed for a bit and it was time to RUN.. Muscle Man moved the treadmill I started my DVR of "House" and set out. SIDEBAR: I love watching House although some of the story lines are a bit far fetched. This last episode was different but totally entertaining, with a few funny dream sequences, the dance number was my favorite they can really sing. Below is the cast, although that is the old group, Amber Tamblyn has joined the group, did anyone every watch "Joan of Arcadia"? I liked that show and suddenly it was over. I also liked her in the Sisterhood of the Traveling Pants movies, yep I love mindless girly movies. I couldn't help but wonder if Hugh Laurie has ever run a Marathon?? He looks pretty darn fit. I looked him up HERE, but nothing.. Oh well..
Back to my run. To run on the treadmill I need a towel, water and something to keep me entertained. I use the towel to cover the screen or I was STARE AT IT THE WHOLE TIME. I had hopes for a SPEEDY 7 miles and set out at 7:47 pace. Around mile 2.6 my right toes were going numb, I think my shoes are a bit too tight...so I hit STOP and changed shoes. Little Stud #1 ran upstairs because he thought I was done and was ready to run.. "Sorry Buddy Mommy still has miles to go." Back on and the sub 8's felt too fast so I changed the speed to about 8:20's. The boys played upstairs running circles around me. I would notice the BOREDOM during the commercial breaks. I knew I would be done when the show was about over. The Last Mile I opted to kick it up and try for sub 8:00's for the run.. FASTER FASTER FASTER the last .25 I was going 6:19 pace, but my sprint was a little too late. I ended the 7 miler at 56:13 and just over 8:00 Miles. SUCCESS!! Done!!! Dripping in sweat I sat and watched Top Model for a few minutes while LS#1 jogged on the treadmill. I was THIRSTY but did not want to leave him alone so I sped down the stairs, this is when this happened next.. OUCH!! I fell HARD on my left hip and crumpled to the ground. Sweaty socks, carpeted stairs and a 6'0 ungraceful oaf don't mix. All the glory of my speedy run vanished and confirmation that I am a big DOOF returned ;) Today my hip hurts a little, I hope I did not do much damage. We have all had injuries on the Run. 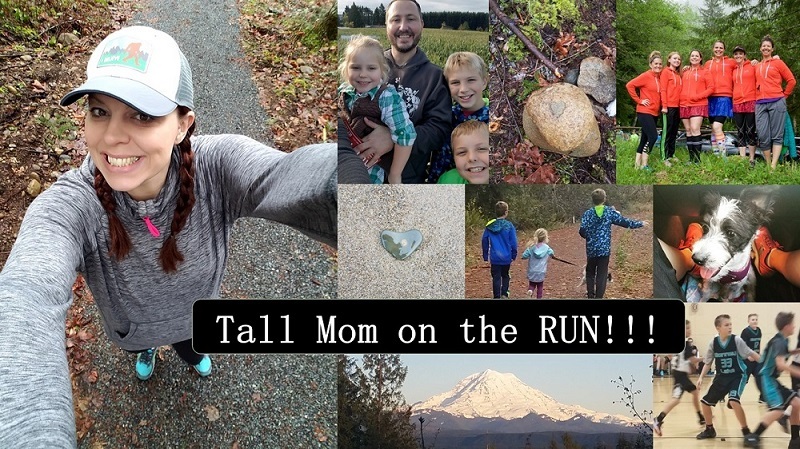 Tell me about your "Life Injuries" or "That could have been bad moments" things that may have sidelined you (or almost) from running but did not happen on the Run. How do you pass the time while on the Treadmill? On the treadmill, NCIS is my sanity. And falling down the stairs stories, 3 weeks out from my fall 09 marathon I fell down the stairs and broke two toes. 6 weeks later, I fell down the stairs again - while holding Natalie. Scariest moment ever. O-No! I hope your hip is okay! I fell several years ago down about 4 steps - landed with my ankle kinda sideways. It swelled up bad - actually went to the ER for it in fear it was broke. That ankle plagued me for years... and now just thinking about it, hmmm, it hasn't hurt in a really long time.... SMILE. I get numbness often in my left foot (outside toes portion). every pair of shoes I've ever ran in. Once I break the shoes in, it tends to go away. I've always been curious what causes that??? AWESOME run Mel!! 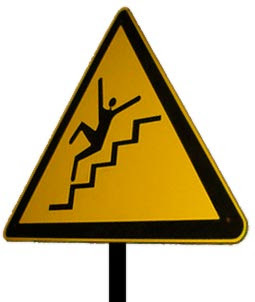 I think we should have a klutz off. My knees are still scarred from the epic amount of falls I took last summer. I have tried running on the treadmill while watching TV but I don't like it. I need to have the driving beat of my IPod blaring in my ears to keep me going. I've fallen down our stairs at least 3 times. I now always, always use the handrail. It's easier to remember when I'm injured, since stairs hurt much. My worst almost injury was a fall mid-taper for my "A" half marathon. I was doing my last tempo run when my dog got scared by something and bolted. He pulled the leash off my wrist and the force in which he did so threw me to the trail. I was covered in mud, bleeding at the knee and elbow and sore all over. AND, I still had two miles to run home.I went for X-rays but was good and beat my goal for the race by nearly 6 minutes. I'm sort of new to the treadmill but I play around with speed a lot, changing it every 0.1 to 0.25. Yikes! Hopefully the hip turns out to be okay. I once fell down the stairs while carrying my son (when he was a baby). I twisted myself so much during the fall to avoid hurting him that I ended up in a lot of pain myself for a while afterwards. I wasn't a runner at that time though, so it just affected my day to day life. 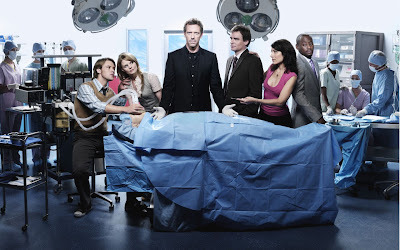 I've never seen House. I need to watch it...I hear so many good things about it. Those were some speedy miles! I had speedwork scheduled last night and managed one (BARELY) sub-8:00 mile, but all the rest were between 8 and 8:30, and I was DYING, even with 1/2 mile jogs in between I'm amazed that you can keep up that pace for 7 miles! Hope your soreness goes away. Hopefully you just have a nice big bruise. I'm a member of the frequent faller club. Some memorable ones are my first bike ride on mountain bike trails (dislocated my thumb 5 minutes in), falling twice in one trail race ON THE FLATTEST PART OF THE COURSE, and two hard sidewalk falls during morning runs. I have to just embrace my klutziness, bc it's not going away. I've only managed four miles straight on the treadmill so far. But when I do, it's books on tape since the mill is at the gym where all the tvs are set to horrible shows. I hope your hip feels better!! I love House! After the episode, I said to my hubs, "I bet that gets an Emmy nomination." Hope you heal up well, I hate falling! I also dislike the treadmill and nothing entertains me. I typically just listen to music- the Y where I use the TM has tvs but no sound? It tripped and fell Monday trying to get to the baby who had climbed up on a chair and was about to stand. My shin is still bruised and swollen today but it doesn't hurt to run. Thankfully, the baby didn't fall off the chair either, she sat down when she saw me running toward her. Awesome job on the speedy run!! Sorry about the fall. :( not fun at all. I hope everything feels okay. I watch movies and documentaries on the treadmill. I actually love getting to see all the movies that my family wouldn't want to watch. As you know I just saw Twilight, awesome. I watched Avatar, awesome. I now think I am in love with a giant blue cat-like creature. heee Not all days are sunny and little guys don't always agree with the jogging stroller so all in all I make the best of having to run in one place. My latest almost sidelined was the first fall in the race. I really fell hard. My entire kneecap is black but oddly it doesn't hurt now. I know that I don't run alone and I thank God for catching me and setting me back up! I loooove watching cooking shows or anything on the Food Network while on the TM. I can dream about food and TOTALLY zone out. You're a doof, I'm a schmuck. It's all good. I watch cheesy shoes like Desperate Housewives and Gossip Girl. I can't watch anything too deep while I'm working out and the cliffhanger episodes make me want to work out again the next day! Sorry for your slip, I hope you're not hurt! Glad you weren't too hurt on the stairs! My worst "life injury" was when my Irish temper flared and I kicked a book case and broke my big toe. So dumb. Here's a "life injury" ... I was platform diving with friends, and got caught up being a goof/show off. I over rotated enough that I landed feet first like I was sitting in a chair in the water. I cracked my tailbone on the water surface (you hit ~ 35-40 mph). Good times recovering from a broken tail bone, I tell you. A cracked crack! I hurt my knee trying to be super mom and carry my 2 year old son plus all groceries up the stairs in one trip. I didn't want to have to go back down. Funny how runners can be so lazy at time. I DVR LOTS of TV to watch. If I did not have TV I would never get on the treadmill. I'm about as graceful as an elephant. I came down with a nasty case of IT Band while PR's my last 10 miler and a few weeks after that fell on a wet set of stairs at the Y and broke my tailbone. When it rains it pours. Oh well. I need a TV near my treadmill!! I'm behind on reading blogs and go figure, I posed the exact same question today!!! I prefer no entertainment outside or on the gym treadmill... but at home, I usually watch a movie! Great minds think alike. Great job on your run! I love that your little guy is hitting the treadmill. Too cute! I hit the gym early in the morning, so I take that time to watch the news and catch up on what's going on in the world. I really need to throw a towel on the display though because I am always looking at it. I am the queen of clutz...I 'tripped' and fell knee first on a stone step after a 32km run. Serious bruising. 3 days later I slipped on a wet bridge and fell...on the same knee. Only I can do this!